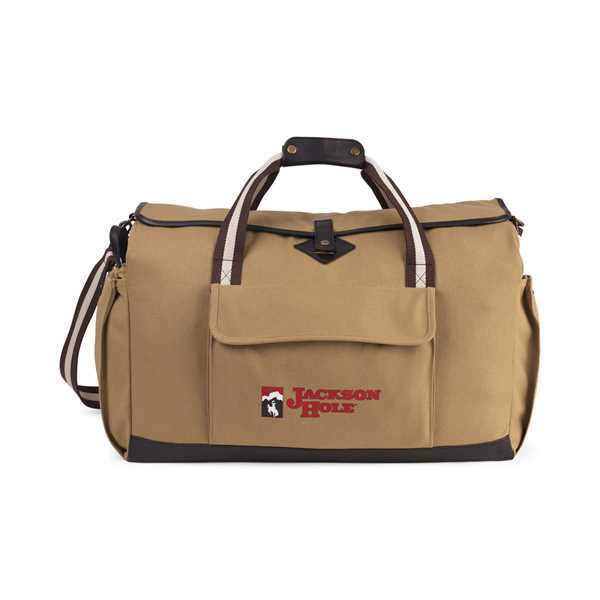 Travel in style with this rugged utility duffel bag! Designed with a stylish dune color and made from 12 oz. cotton, this bag has plenty of features including a top flap with interior zippered pocket and closure that covers over the zippered main compartment, a front flap pocket for storing accessories, side pockets with snap closures, a removable zippered amenity pouch, faux leather bottom, stylish plaid interior lining, antique brass hardware and a trolley strap feature that slides over upright luggage handles for ease of mobility. Carry it comfortably using the top grab handles with handle wrap or the removable, adjustable shoulder strap. With an assortment of decorating options, you can customize this bag to create a promotional item that everyone will love to carry around!